At Let’s Talk Shred, we take our responsibilities seriously, and we appreciate that this is an increasingly important issue for many of our clients. By just making the choice to shred your paper or old uniforms with us, you are avoiding the environmental impact of sending it to landfill and enabling us to recycle it effectively for you. 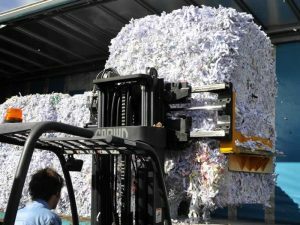 Regular collections or one-off shredding options to help your business comply with data protection regulations. Secure destruction of confidential paperwork and digital media storage devices to help keep your personal details safe. Watch our paper shredder in action. From the collection of your material to its secure destruction, we ensure your information is kept confidential. We recycle 100% of our paper waste, as well as limiting our carbon footprint and planting trees.